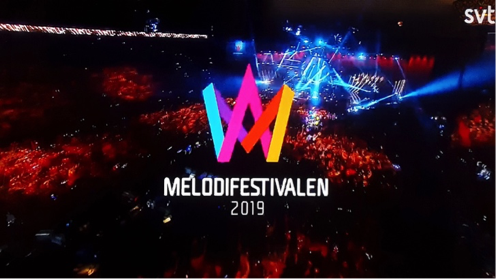 It’s Saturday—so it must be time for Melodifestivalen! Performing in “Mello” for the seventh time (and eighth as song cowriter; he came in second in 2007), this young girls’ soccer football coach from Skåne found international success in 1999. This year he found inspiration in the team spirit of his players for this upbeat English pop song with a rock-ish edge. Personally, he reminded me mostly of Rick Springfield (The Husband says Bono), and the song put me in mind of last year’s entries from Switzerland and Romania. From the small town of Ryd in Småland comes this 15-year-old quintessential Swedish girl: lovely, blonde, and an innebandy (floor hockey) player who also is studying economics. She’s sung since age 3; usually shy (she says), she comes alive on stage. 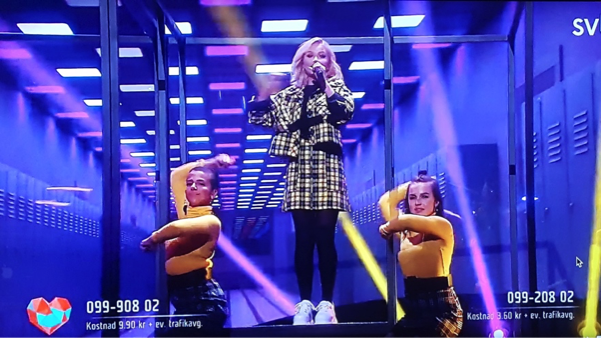 All in sneakers and modest black-and-yellow plaid schoolgirl outfits against a backdrop of a school hall lined with lockers, Malou and her two backup dancers make the most of the catchy pop ditty (written in English by four women) about it being “not meant to be… you do you, I do me.” Charming! Once a member of the Grammy-winning The Fooo Conspiracy (and eighth-place finisher in Mello 2017), this young man is now on his own, where “it’s all on you” to make all the decisions, and he co-wrote this English song that started slow and then turned into danceable pop. Twisting in his giant flashing cube (a bit reminiscent of Benjamin Ingrosso’s light show from last year), his middling vocals did not save the repetitive lyrics of this song that seemed to be about parents not understanding how much he (and his nail polish) love it, whatever it is (which we still haven’t figured out—maybe nail polish?). This YouTube sensation from Belarus (who moved to Sweden at age 9) has 400,000 subscribers. The song (in Swedish, co-written by Vlad) had a catchy Latin beat, and he and his backup dancers (two men, two women) gave a kicky performance. Although some of them were dressed for it—in something plastic—there was no rain (like last week’s downpour that drenched Wiktoria), but they threw something that looked like water out of their pockets at one point. Close friends for over a year now, Hanna (second place in “Idol” in 2017) and Liamoo (2017 “Idol” winner and 6th place in 2018’s Mello) sang a ballad (which Liam co-wrote) reminiscent of last year’s Spanish contribution at ESC. The lyrics (in English) included “Without you, I’m frozen” and “Wherever you go, I will follow.” Liam had a bit too much swagger for my taste, and I found the vocals just OK and the song a bit repetitive. (I’m also not much for ballads.) However, the windy background complemented the on-stage emoting. This lovely young woman comes from Poland, where she finished second in its 2016 Eurovision selection process, but though she doesn’t speak svenska, she has a Swedish record company and finished seventh in last year’s Mello (with one of my favorites, “In My Cabana”). This year’s attempt had a similar Latin-Caribbean motif. In an odd blue, asymmetrical velvet dress, she started surprisingly slow and weak, I thought, but the song soon picked up, with a number of sneakered backup dancers (some projected and some on stage), and finished strong (though it was no “Cabana”!). 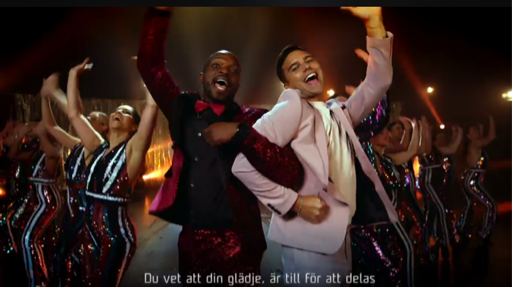 During the interval, the male hosts, Kodjo Akolor and Eric Saade (ostensibly “on the road” fixing a broken-down van) were featured in a humorous, clever music video about Melodifestivalen* itself, poking affectionate fun at how some (like to) hate Mello—but everyone talks about it. Mello has something for everyone (kids included), and it’s where everyone is welcome and can do what they want (cue Eric kissing a woman, then a guy, plus clips of a variety of unusual past acts). Guest appearances included Robin (“not Robyn!”) Bengtsson and Pernilla Wahlgren (fourth in Mello 1985). OK, “vi har ett resultat!” In the first round of voting, “Army of Us,” “I Do Me,” “Nakna i regnet,” “Hold You,” and “Tempo” advanced. So long, Oscar and Jan! In the second round, “Army of Us” and “Nakna i regnet” advanced to Andra Chansen (Second Chance) on March 2. But “I Do Me” and “Hold You” are on to the final on March 9! Malou joined Hanna & Liamoo on stage for the reprise of their number. So long, Margaret (sniff! ), but grattis (congrats!) to Malou and Hanna & Liamoo! * Note: The videos of the hosts (possibly others too) may not be available from late on Monday, February 11 until February 23.